It’s time to announce another Blogger Birthday feature! Many users have been asking for an easy way to implement “Read more” links on their blog’s index page. In fact, for years bloggers have been implementing “Read more” jump breaks themselves by manually editing their HTML — a process that was complicated and error prone. With Jump Breaks you can show just a snippet of your post on your blog’s index page. 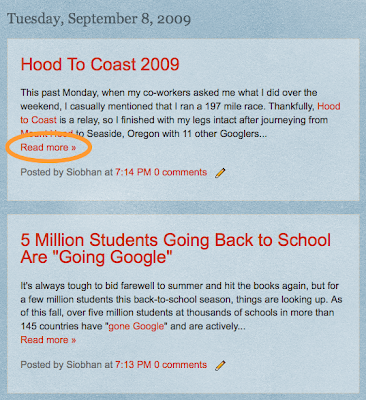 Blogger will insert a “Read more” link to the full post page where your readers can keep reading. There are a couple of ways to insert a “Read more” jump to your posts. If you use the new post editor (available on Blogger in Draft, or by enabling it via the Settings tab), you’ll notice the “Insert jump break” icon in the editor’s toolbar. Click this icon and the “jump break” will be inserted into your blog post at your cursor’s position. If you don’t use the new post editor, you can still insert a jump break in Edit HTML mode by adding <!– more –> where you want to position the jump break. Want to change the “Read more” text to something more your style? No problem. You can edit the “Read more” text by clicking Layout and then Edit the Blog Posts widget. Mudah-mudahan artikel tentang Read More Feature On Blogger ini bisa bermanfaat untuk anda, terima kasih. Jika menggunakan gambar pada postinga bisa gak diatur pak?? klo misalnya related post gmn mas?